Dialshree is one of the most advanced call center solutions. We are glad to announce that we have successfully integrated WhatsApp in Dialshree. DialShree is a complete Contact center solution which supports all different modes of communication and for Indian customers, we offer Turnkey Contact Center Solution, which means we provide both call center software and hardware to setup an in-house call center. We are really glad to share the news about the featured article on the entrepreneurship journey of our Co-founder and director, Mr. Mehul Shah by the GlobalLinker. 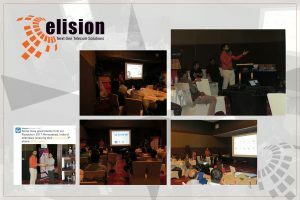 We, Elision Technolab LLP, are in the VoIP industry for more than a decade and we develop unified communication solutions to help businesses enhance the communication and empower collaboration. As one can imagine, our company has gone through many ups and downs and proved itself a leader with its best VoIP solutions in the industry. As we had shared earlier, we were one of the exhibitors at Vibrant Gujarat 2019. The vibrant Gujarat is an international B2B event which took place for 3 days, from 18 January, 2019 to 20 January, 2019. The event hosted international expo, conferences and B2B networking events. We are glad to share that we were one of the exhibitors at the international expo and we are excited to announce that this event was a really successful event for us. Let me share some highlights of the event. We are glad to announce that we are one of the exhibitors at Vibrant Gujarat 2019. We have occupied the booth no: 29 in Hall no 05. We will be attending our booth visitors in the Vibrant Gujarat from 18 January 2019 to 20 January 2019 at our booth. Our CEO and Founder, Mr. Mehul Shah, was selected as one of the delegates in the private business event, called, TradeConnect. The event was a commendable initiative taken by the GlobalLinker. The GlobalLinker came with an amazing thought of connecting business owners of three Asian countries, namely, India, Singapore and the Philippines and to encourage cross border business opportunities. The GlobalLinker sponsored the whole event which was conducted in Singapore. The event was under the same roof where the famous Singapore event takes place, called, Fin Festival Singapore. This time the Fin Festival Singapore was buzzing more than before because of the presence of India Prime Minister Mr. Narendra Modi. The organizer of TradeConnect had selected 25 business owners from each mentioned Asian countries and we are glad that our CEO and Founder, Mr. Mehul Shah, was one of the chosen Indian business owners. Interactive Voice Response, or IVR, is the latest technological response system on the block. Putting it simply, an Interactive Voice Response system enables a computer to interact efficiently with a caller. Cost competitiveness is pivotal for organizational survival in a volatile market characterized by unpredictable changes and intense competition. IP/PBX, the automatic telephone exchange working via Internet protocol (IP) is easing the way corporates interacted internally. IVR system has contributed immensely to the progression of healthcare industry. A system which was employed previously in the call center industry has been found to be advantageous in healthcare management, as well.